Discussion in 'Game Support' started by DukeofRealms, Apr 29, 2016. Note: This is for people who wish to contribute to the official translation project at translate.star-made.org . This is NOT for end users. 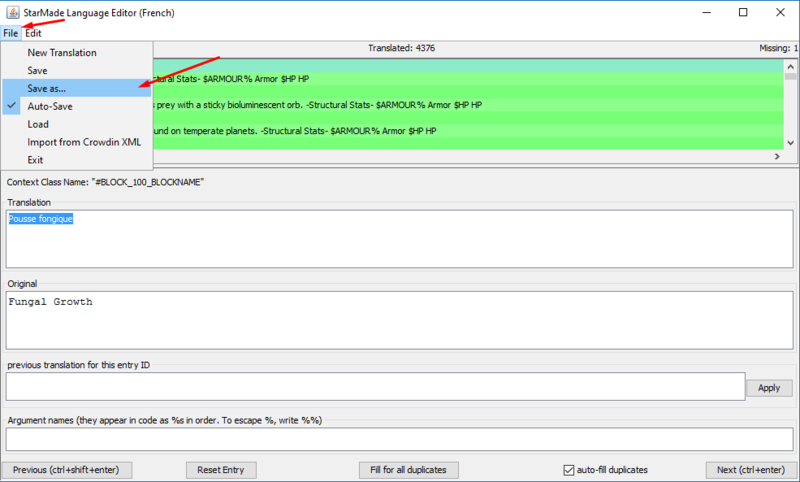 This section is on how to export a CrowdIn XML and import it into StarMade for translation testing and/or actual use. 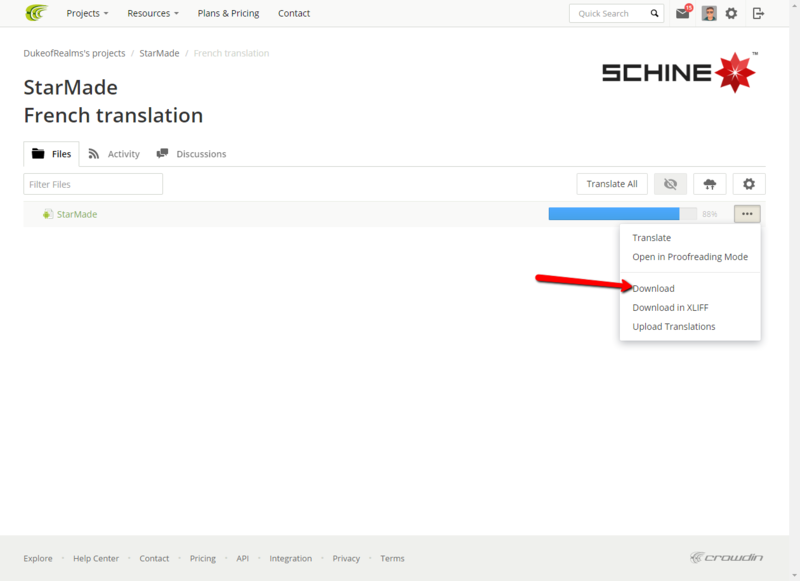 To download the latest StarMade community translation from CrowdIn, you'll need to go to StarMade — Translation Project on Crowdin and download the XML. 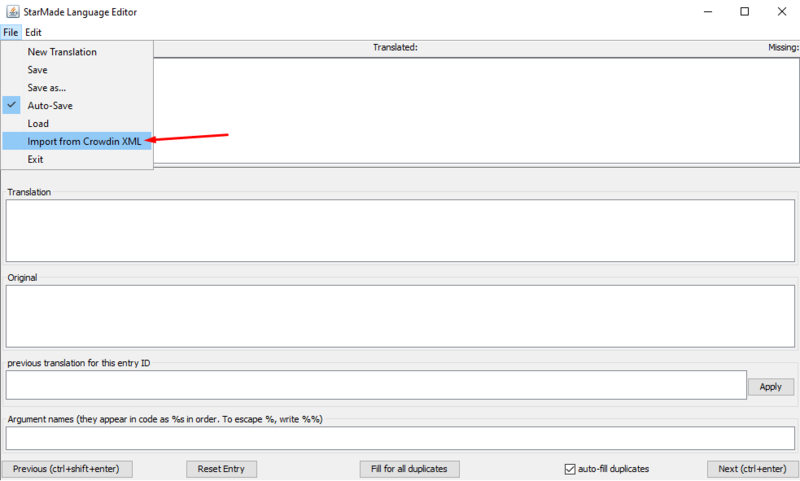 Select the language you wish to export, in this case, French. 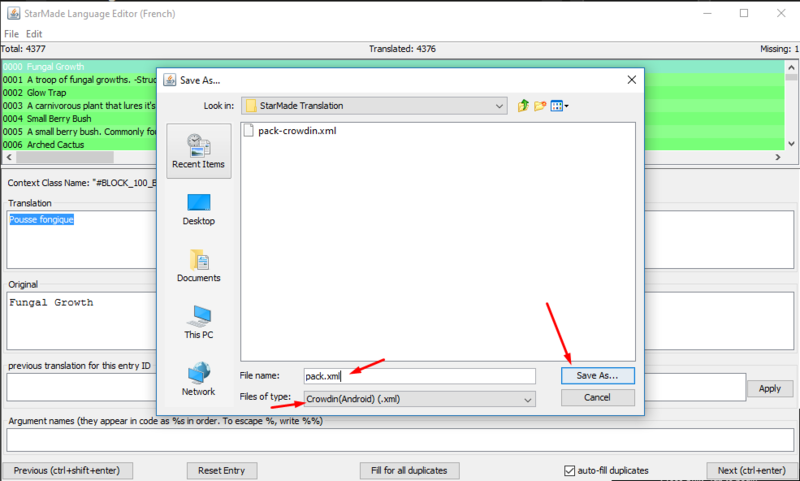 Click the "..." symbol and then click "Download"
You should now have a pack-crowdin.xml file, which you will need to convert to the StarMade language pack XML format using the StarMade Language Editor. 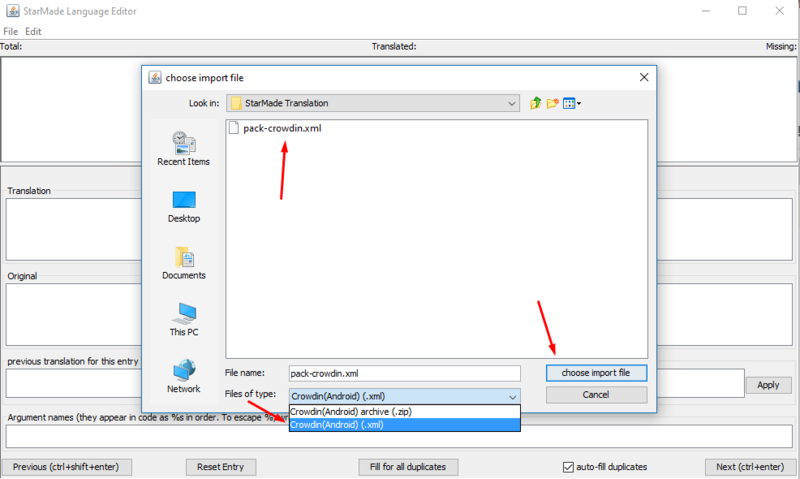 Type the name of the language you wish to import and then press "OK"
Import the "pack-crowdin.xml" file you downloaded from translate.star-made.org earlier. Finally, set the file type to ".xml", name the file "pack.xml" and "Save As..."
Go into the StarMade language directory ...\language and upload the pack.xml file you just saved. 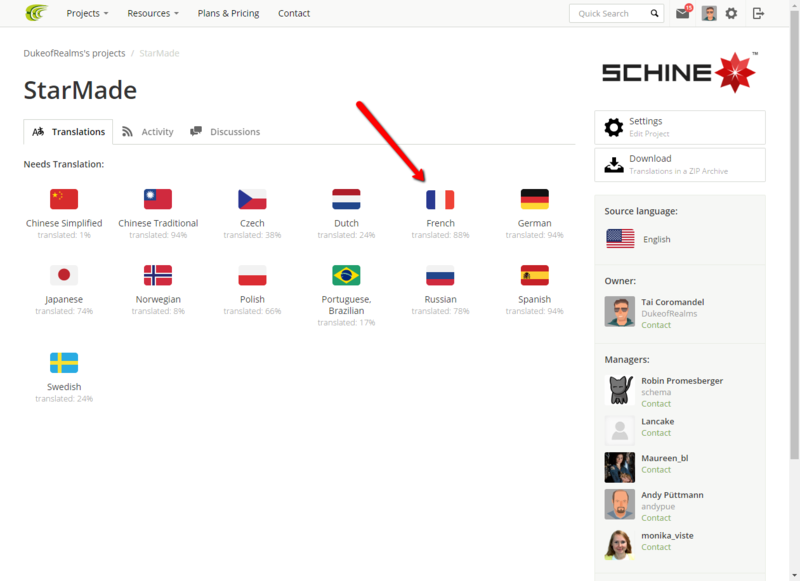 If you wanted to upload a French translation, you'd create a "frenchnew" directory in the language folder (do not name a language the same name as an existing one, this can cause issues). Upload the .xml file to ...\language\french\pack.xml . The .xml file must be named "pack.xml" so you'll need to rename it (if it isn't already called that). 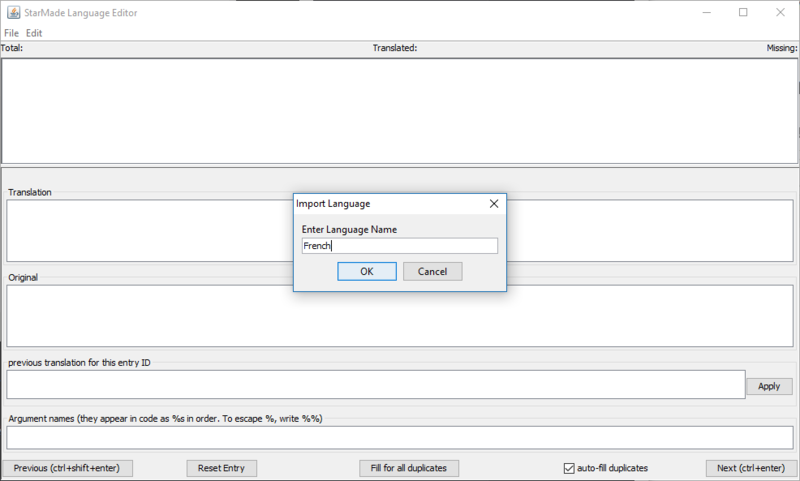 Finally, edit the settings.cfg file and change the LANGUAGE_PACK = english line to the language pack you just saved. In this case, we'd change "english" to "french" . Launch the game and the language pack should be loaded into the game. For languages that don't use the Latin alphabet e.g. Chinese, Korean and Japanese... a custom font must be used. 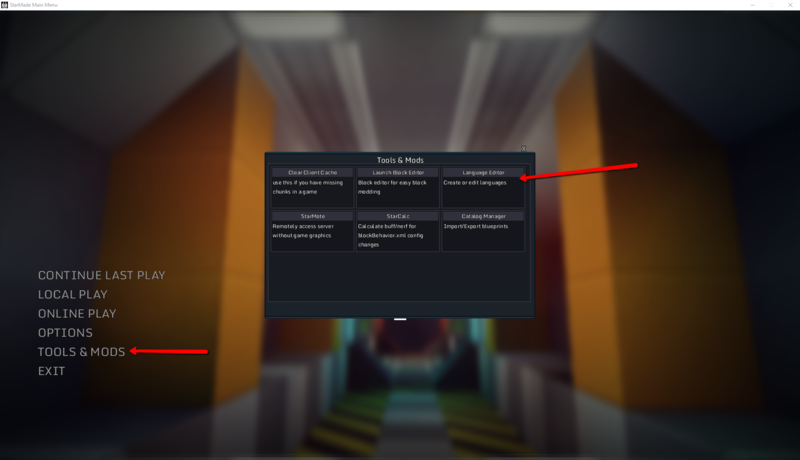 If one is not specified, the characters will not show up (StarMade's default font does not support non latin characters). In the near future, we will be bundling fonts that support all these characters. For now, one must be uploaded to the language folder. Note: Currently, only .ttf fonts are supported. For example, specifying a custom font for a Chinese Simplified language pack, it would be <Language Language="ChineseSimplified" Version="0" fontnameorpath="language/chinese/NotoSansCJKtc-Regular.ttf"> . With "NotoSansCJKtc-Regular.ttf" being the font file. We recommend using Google's Noto Font (this font is free to use). I'm a bit confused, is this a guide on how to install a new language in starmade or a guide to contributing to the work in progress translation? Both, this is just making what was already possible (contributing to the translation effort) much easier to make, test, and install. Why not just have a dropdown box and all these languages included in the next patch, and simply put the updated ones in every patch? we already do it with texture packs. Because this is for translators, not the end user. The files on CrowdIn are different from the StarMade XML language packs, this is to support all features CrowdIn provides. Language packs have not been fully translated yet, once they are translated, they must be approved by a professional translator to make it in the game. If you're not one of the 217 translators who have already contributed to the project, or not someone who is starting to translate StarMade, this tutorial is not for you. I've updated this page for the Main Menu update and added a section for specifying custom fonts in a language pack. A custom font is required for languages that don't use a latin alphabet, for example Chinese, Japanese and Korean. A custom font is required for languages that don't use a latin alphabet, for example Chinese, Japanese and Korean. Will modifications of latin letters (e.g. Ää Öö Üü ) also require custom fonts? If not, what about special characters in languages that primarily use the latin alphabet (e.g. the ß in german)? Those are all fine, the game already supports all those characters. I'm a new french contributor for translation (i also began translating some stuffs of starmadepedia.net/wiki > fr.starmadepedia.net/wiki, for instance, my first substantial translation). I'm a fan of Starmade in more than 1 year and i really like my (native and first) language but current translation is not good enough for me, so i want to help improve SMD's attractiveness for french players, if I can. Is Crowdin project still in service? We can see some " \ " to escape the singles quotes " ' ", Crowdin add this when we downloading the pack-crowdin.xml. Usefull or useless feature ? I've tried to delete all the 3400+ " \ " in my final pack.xml and I had no trouble in SMD, so... OK ? If ok, I could write a little batch file for the community to delete this ugly thing, until developpers solve that (or you can use this Regular Expression in Notepad++ or other editor: found " \\' " replace " ' "). Last thing, how to easily know where we need to place the carriage return" \n " in a sentence? And I'd very much like to have a list of contexts. Is it possible to translate a direction into a logic signal?